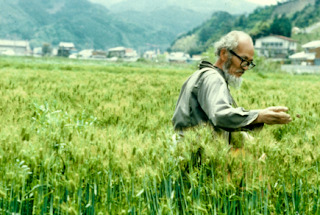 ianwatt.blogspot.co.uk: MASANOBU FUKUOKA - "THE ONE-STRAW REVOLUTION"
MASANOBU FUKUOKA - "THE ONE-STRAW REVOLUTION"
"Drifting Clouds and the Illusion of Science"
I've been revisiting this wonderful book. It's partly about the practical aspects of a way of natural farming, about growing rice, other grains and clover in a rotation without ploughing or using chemicals. It is indeed revolutionary, not only are the yields just as high as in traditional Japanese farming but it also eliminates a lot of the work. Also, compared with chemical-industrial farming, Fukuoka's way continually improves the quality of the soil instead of degrading it. But I think the even more important revolution that the book describes, in his charming style, is Fukuoka's internal journey. Moments of insight, the alienation from the modern industrial consumerist approach to life, the gradual deeper understanding of natural processes, all leading to a simple life looking after fields and orchards, growing and eating simple natural food. Here's some of Fukuoka's last words, "There is nowhere better than this world. Years ago I realized that we human beings are good just as we are and I set about to enjoy my life. I took a carefree road back to nature, free from human knowledge and effort." Thank you Ian... A facebook post talked all about ff addiction and how we have to change our behaviour; my response... yeay, lets have a party, lets celebrate our greatess achievement as a species - destroying an entire planet in the pursuit of what!!!. I read your blog think back to last year and my visits to Spain... Until the mid 1970's Maella, Spain were still utilising the barter system, most towns folk didn't have cars; consumerism is creeping in. I was out there 3 times last year and there are acres of fincas, and for off griders it is paradise - the draw backs... wasps, mosquitos, spiders, ants all by their thousands... and I got bitten and blistered... the insects certainly loved me! Anyway I came back, eagerly to my 'city' living, grateful for indoor plumbing, electricity etc... we do need to get our act together and fast!